Web Connection's user security implementation allows a lot of customization including taking over the user validation, displaying the form and for handling requests after a user has logged in by way of a few events that let you replace small chunks or the entire process of Authentication. The following is a sample implementation that completely customizes the authentication pipeline to demonstrate each of the hooks you can plug into. Please note that you can choose which parts to override - you can override just validation and use the rest of the UI, override the UI and use the default validation logic, or completely override everything and do your own thing. First you need to specify that you want to use custom usersecurity authentication by setting the cAuthenticationMode to UserSecurity. You can override the first 3 properties to affect security behavior. The last 3 properties are set after authentication has succeeded. Override to handle the actual authentication of a username and password and return .T. or .F. Often this is all you need to do to hook custom authentication into your app. This method is called after a successful login and you can use this to read or set additional session variables. This method lets you override the rendering of the Authentication form. All of these methods are driven by the .Authenticate method which is fairly complex. While you can override Authenticate in its entirety it's usually easier and more modular to just override the event methods. The first step is to apply Session support to the application since UserSecurity authentication uses sessions to track users. In this example I use global session support for this process class, but you can also isolate the Session support just for the authenticated requests in the application. Next you need to figure out which requests in your application require Authentication. You can do this globally or on a per request basis. In either case you call the wwProcess::Authenticate() method to check for authentication. The code as written should work using the stock authentication display and user authorization by showing the default login dialog. What follows is the customization to override the authentication behavior as well as the user interface. The default authentication behavior is handled by the OnAuthenticateUser() method which is passed username and password and by reference error message parameter. This method is internally called to validate the username and password. If you prefer to use your own authentication mechanism from your own business objects, or from Active Directory or other source this is where you can hook it up. Note: you only need to do this if you want to hook in your own authentication logic. If you don't override this method you get the stock wwUserSecurity login functionality. *** is similar. Save/Load methods. Note that I'm setting session variable for the custom value I'm tracking which is the PK of the user while the UserId and Name are automatically tracked just by the property names on the wwProcess instance. Once you are authenticated all subsequent requests just go through with the authentication set. Specifically the Process.cAuthenticateUser, Process.cAuthenticatedName and Process.lIsAuthenticated properties are set. This may be all you need to ensure your app is properly logged in so the following event is optional. If you need to store additional information about each authenticated user, you can get notified whenever the user is authenticated on each request via the OnAuthenticated event. The default login dialog provides username and password fields in a very basic login form which is based on a template stored in views\_login.wcs. You can customize this application specific template which is the easiest way to customize the layout. If you want to completely customize the display you can override the OnShowAuthenticationForm() event which is responsible showing the form that the user sees for entering credentials. This code could be anything that generates HTML as long as it contains an HTML form that posts back the WebLogin_ form variables when submitted. Note that the default login form is login.wcs which I use here and which is also used by the login page (next section) so the same form is used in both cases. 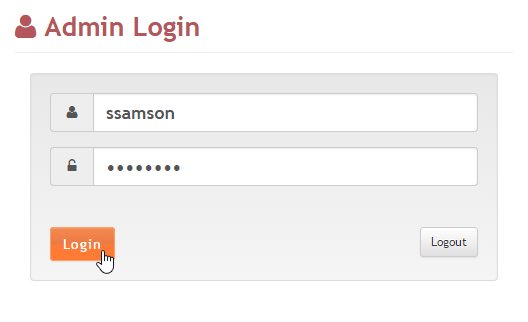 I can simply modify the 'standard' login template to match whatever I need it to look like. The important thing to remember though is that it doesn't matter how you generate the HTML - just that you do and that you likely want to use the same HTML when you render the plain Login page when the user explicitly accesses that page. To get an idea what layout to use you can use the views\_login.wcs page as a starting point. So that's what's required. This sounds fairly complicated, but most of this code is really boilerplate and only required if you want to override everything. You can choose what to override. Maybe you only to hook in a custom user validation scheme - implement on OnAuthenticateUser. If you want to hook up custom variables that store user info you can do that by overriding OnAuthenticateUser to store the values into session, and then OnAuthenticated to retrieve those values out. If you only want to override the display implement OnShowAuthenticationForm. There are lots of options, for default processing to minimal overriding to taking over the whole process. Note that wwProcess::Authenticate is the method that drives this entire process which fires these events. If you want even more control you can take over that entire method as well. For completeness sake I'm providing all the code described for the custom implementation described in this page as a single block of code for easier reference and using it as a template to work with. ***            and routes postbacks to the Authenticate() method. ***  Function: Just a routing mechanism to allow logging out. ***            showing the application template. pcDisplayMessage = "No account? No problem - <a href='Profile.ttk'>Create one</a>"
***            values out of the session.